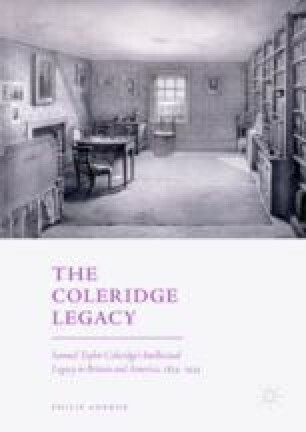 Aherne argues that Coleridge’s influence on philosophy and theology is, in many ways, the most revelatory component of his legacy, because his intellectual credentials were called into question so persistently after he died, dramatically diminishing the validity of his contribution. Indeed, his dubious status as a philosopher has long undermined his (rightful) position in the history of nineteenth-century thought, but his ‘constructive’ philosophy armed the succeeding generation against scepticism. The chapter outlines how Coleridge’s approach to philosophy generally (particularly his distinction between the Reason and the Understanding) made him an intellectual catalyst for American philosophers before examining the endurance of Coleridge’s defence of faith as self-evidencing through emotional conviction; lastly it discusses the intellectual development of those influenced by Coleridge, as well as analysing the fate of some of his positions. Smith, Gary Scott, ‘Atwater, Lyman Hotchkiss’, in American National Biography Online (Feb. 2000), http://www.anb.org/articles/20/20-00039.html. Accessed 18 July 2013, 09:47. Stevenson, Louise L., ‘Porter, Noah’, in American National Biography Online (Feb. 2000), http://www.anb.org/articles/09/09-00600.html, Accessed 18 July 2013, 09:30. Tyler, Colin, ‘Thomas Hill Green’, in Edward N. Zalta (Ed. ), The Stanford Encyclopedia of Philosophy (Summer 2011 Edition), http://plato.stanford.edu/archives/sum2011/entries/green/. Stanford Encyclopedia of Philosophy, http://plato.stanford.edu/entries/green/#2. Accessed 13 Nov 2012, 15.52. Vickers, Neil, ‘Review: Ronald Wendling, Coleridge’s Progress to Christianity: Experience and Authority in Religious Faith (London: Bucknell University Press, 1996)’, in Romanticism on the Net, Number 14 (May 1999), http://www.erudit.org/revue/ron/1999/v/n14/005861ar.html?lang=en. Accessed 30 Apr 2014, 22:24. Vincent, Andrew, ‘Green, Thomas Hill (1836–1882)’, in Oxford Dictionary of National Biography, Oxford University Press, 2004; online edn. (Jan 2012), http://www.oxforddnb.com/view/article/11404. Accessed 7 May 2014.